Poetry & Popular Culture correspondent Phil Metres reflects on the life and times of Lebanese poet Khalil Gibran, author of what's become the best-selling single volume of poetry in U.S. history. Of all the things Gibran was—a man, a legend, a local-boy-made-good, a salve for the spiritual homelessness of immigrant Arab Americans—he was also a guest at the Brooklyn Heights home of Metres's great- grandparents in 1927. Read on to find the full text of Gibran's thank-you letter to the Boulos family—and to discover the nation of prophets that The Prophet left in its wake. The first thing you'll learn about Khalil Gibran from an Arab—particularly from a Lebanese immigrant in love with the Old Country—is that Khalil Gibran's name is not, in fact, Khalil Gibran. Nor is it, as my Knopf edition of The Prophet has it, “Kahlil Gibran.” Rather, he was born Gibrān Khalīl Gibrān bin Mikhā'īl bin Sa'ad. It might be typical for an immigrant to the New World to shed some of the flourishes of an Old World name, so the Ellis- Island-style reduction is not so surprising. 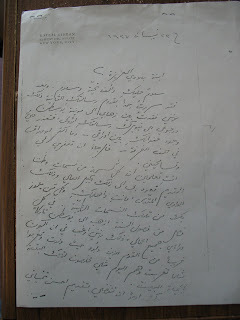 However, the spelling of Gibran's first name still mystifies me; in Arabic, the sound that we transliterate as “kh” is, if I’m not mistaken, an aspirated “h” sound, so the displacement of the “h”—which appears not only on his books, but also on his letterhead—is but one of many mysteries of the boy from Bsharri. "Shakespeare, we are told, is the best-selling poet of all time. Second is Lao-tzu. Third is Kahlil Gibran, who owes his place on that list to one book, 'The Prophet,' a collection of twenty-six prose poems, delivered as sermons by a fictional wise man in a faraway time and place. Since its publication, in 1923, 'The Prophet' has sold more than nine million copies in its American edition alone. There are public schools named for Gibran in Brooklyn and Yonkers. 'The Prophet' has been recited at countless weddings and funerals. It is quoted in books and articles on training art teachers, determining criminal responsibility, and enduring ectopic pregnancy, sleep disorders, and the news that your son is gay. Its words turn up in advertisements for marriage counselors, chiropractors, learning-disabilities specialists, and face cream." But in my household growing up—and in my father's childhood home—Gibran was a revered name, not only because he was a Lebanese poet who wrote the ubiquitous The Prophet, but also because he hailed from the hometown of my father's mother: Bsharri, Lebanon. In fact, Gibran even came to stay at my family's home in Brooklyn Heights (290 Hicks Street) for a while. According to family legend, he even wrote some of his Prophet while there. I can’t confirm that legend exactly—it seems the sort of mythic and delusionary grandeur that I love about my family. But I do have in my possession a letter that Gibran wrote to my great-grandmother thanking the family for their hospitality and generosity. Whatever else you want to say about Gibran, he was a local boy made good. And, in the process of blazing his trail from Bsharri, he gave Arab Americans and Arab American poets a figure of their own possible success in translating ineffable Bsharris into poetic Brooklyns. I salute you with a thousand salutes. I was very happy receiving your second letter, this is due to missing your first letter between my going to Boston and getting back to New York and could not find your address among my papers, and there are so many of them in this room. I beg your pardon and forgiveness. You will know that every breeze from our Old Country breezes takes me back to that high mountain and that holy valley, you and your family and all that surround you are from these delightful breezes. In every season I leave to Boston, leaving behind me all my works. This is because I prefer to be around people who were where I was born and they like I did and they are like me and sincere to this beautiful far country. I beg you first to give best wishes to your kind husband and children (old and young) (God bless them), and second to mention my name with kindness to your dear parents, and to your relatives. They are, like you well are, related to me. The same blood that flows in their veins flows through mine too. In her review of Gibran's life, Acocella notes, “a later mentor declared him a mystic, 'a young prophet.' (This was before he had published anything professionally.) And so he began to see himself that way.” I, too, was baptized into the possibility of self-mythology. It was a gift, I see now, to have the sort of parents willing to see prophecy in a vexatious, self-conscious, over-serious and dreamy child. As Gibran would have it, via the Prophet’s own words: “Your children are not your children… You are the bows from which your children as living arrows are sent forth.” Something like that. Phil Metres is an Associate Professor of English at John Carroll University. He is the author, most recently, of To See the Earth (poetry), Behind the Lines: War Resistance Poetry on the American Homefront, Since 1941 (scholarship), and the poetry anthology Come Together: Imagine Peace. You can find his blog here.